Delete Facebook Account: With social media nowadays becoming an integral part of our daily lives, many privacy concerns have cropped up in recent times. And amazingly Google Trends have shown a significant increase in the searches related to how to get rid of social media profiles/accounts. So, to make the things easy for our readers, we have come up with a step by step guide on how to lay off Facebook! This guide is how you can delete your facebook account for good (permanently or deactivate temporarily). It all depends on your needs as if you want to focus on your studies or project and don’t want to get disturbed by things happening in the virtual world. Or you may be offended/concerned regarding your privacy being vulnerable. Deleting vs Deactivating: What’s Your Need? 1 Deleting vs Deactivating: What’s Your Need? Before we move on, it’s better we decide what one actually needs to go for? Should you deactivate your profile or Deleting it is the solution to your problem? This one has got a tag of “temporary” attached to it! As the name itself is self-explanatory, it’s like telling that you are not going to be active for a while. So, if you opt for this you can always come back – the so-called Reactivate! You can reactivate your account whenever you want. All you need to do is simply log in with your regular credentials and no one will even know if you were ever gone! People can’t see your Facebook Timeline, or search for you. In a crux, you will be non-existent for the outer world! Some information may remain visible like the messages which you would have sent to your friends. Only this time, they will see a plain black text for your name instead of the regular hyperlinked ones. Face-book has got all your details and data, in case you decide to drop by again. You need not make any changes when you are back! All settings and preferences and posts will be as same as it was when you decided to ditch it. Check: next steam sale date. Facebook delays deletion for a few days after the request is made. In case you decide to that you took the decision in haste and log in again with regular last credentials during the grace period, the deletion is canceled. You can’t regain access to your Facebook account once it’s deleted i.e after that grace period, everything is permanent! It can take up to 90 days for your data that’s stored in backup systems to be deleted. However, this is after the grace period, so your info isn’t accessible on FB during this time. But still here also, FB can’t delete your names from the inbox of those who have received messages from you. Copies of some material (like log records) may remain in Facebook’s database but are “disassociated from personal identifiers,” according to the company. Basically, to the outer world, you will be gone in both the cases. The difference lies the factor of being permanent or temporary and the storage of your personal data over its servers. That being clear, let’s now get to know how to do delete facebook account. If you want to come back again, just log in as usual and everything will back to what it was. The file that begins downloading will contain your Facebook profile information, so be very careful about where you keep it if you are concerned about your privacy. Now data backed up, let’s see how to delete the account. Facebook as such does not provide an option to delete an account permanently. So, you will have to ask FB itself. Here is how to do it. At the right top click on the “Quick Help” button – the question mark. Search “delete the account permanently”. 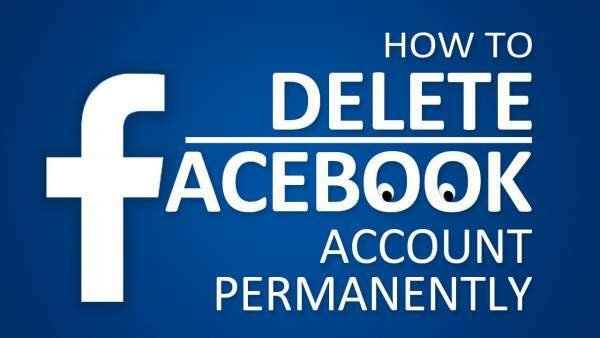 You will see a result “delete facebook account permanently”. You will be asked your password and after submitting, you are good to go. You are gone! However, you should keep in mind that whatever you shared or messaged to someone, it will remain with them even if you delete your account. Hope you got to know how to delete facebook account and temporary deactivate fb account.